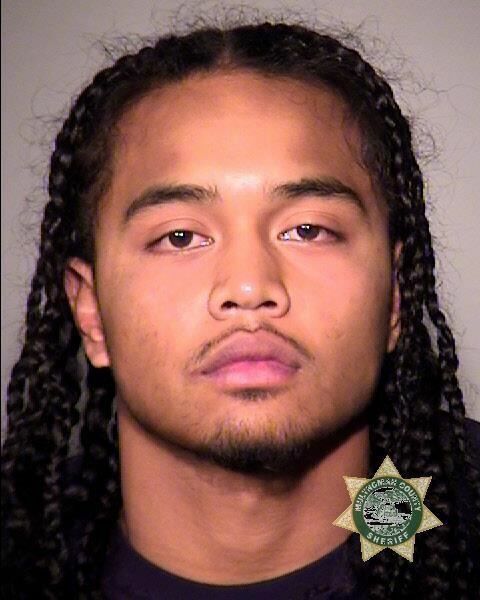 Awasioeth Epenrosa arrested after police say he punched an officer who approached 'unruly' group. Portland police say an officer was punched after he used pepper spray on an allegedly "aggressive" individual standing on a light-rail platform. Transit Police say they contacted an "unruly" group congregating on the Lloyd Center MAX platform around 8:20 p.m. on Saturday, Dec. 1. The group became "hostile and aggressive," according to a news release, and an officer unleashed pepper spray on one man, who apparently slugged the officer in the face and then ran from the scene. The officer suffered "non-life-threatening facial injuries," authorities say. Awasioeth Reity Epenrosa was taken into custody one block away. The 20-year-old faces potential charges of assaulting a police officer, riot, second-degree failure to appear, fourth-degree assault, interfering with a police officer, menacing, harassment and interfering with public transit. In the last four months, Epenrosa has been charged with second-degree burglary, third-degree theft, second-degree criminal mischief for cases in Washington and Multnomah counties, according to court records. Epenrosa remains behind bars at Inverness Jail at this time.